I've been reverse engineering how the Netgear R6200 web server parses a new firmware image when you use the firmware update facility in the web interface. Manually browsing to the router's web interface, then to the firmware update form, then browsing to a firmware file on disk, then clicking "upload" gets really tedious after a few times. 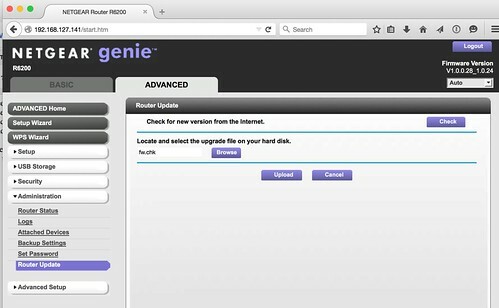 Updating the Netgear R6200's firmware through the web interface. I wanted to use Bowcaster's HttpClient class to do this programmatically. Unfortunately, it lacked the ability to generate a multipart/form-data POST body, so I added a class to help with that. I know; there are 3rd party Python modules to do this already, but I don't want Bowcaster to have any dependencies other than Python, itself. Anyway, below is an example program that uses the class to upload a firmware image, which you can get here from Bowcaster's example code. In order to identify the fields that need to be populated, I manually uploaded a file through a web browser, and analyzed the POST request in Burp Suite. Example code to upload a firmware file to the Netgear R6200 firmware update form.